Assalam o Alaikum, My Name is Abbas Malik, In another new job, I welcome everyone Vacancies has been announced by Pakistan Army. I will give you complete information about the new recruitment of Pakistan Army in this article. You have a chance to get as Captain job in Pakistan Army again. 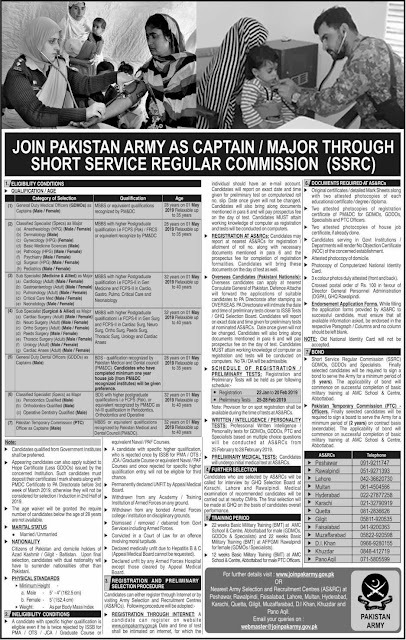 In this job of Pakistan army, Major Through Short Service Regular Commission both boys and girls can apply. About 650 jobs have been announced by the Pakistan Army, in which all Pakistanis can apply. Your education should be an MBBS to apply for the job of Pakistan Army As Captain (SSRC) 2019. It should be a Pakistani citizen to apply for this job. All Pakistan Army jobs are very good, it gives you a lot of benefits, and many people are waiting for Pakistan's job, so you can benefit from that opportunity. Various types of jobs have been announced by the Pakistan Army in Major Through Short Service Regular Commission for both men and women. You have any questions, then you can do comments regarding Join Pak Army As Captain (SSRC) 2019. MBBS or equivalent qualification FCPS recognized bt PM&DC or BDS with higher postgraduate qualifications. Date and time of test shall be intimated on the internet, Click on the link below to apply online.